Ever since I did my first review of SodaStream my love for it grown. I can’t tell you how much money I have saved from not buying pop and juice boxes. It’s so much easier to make my own and my son loves it. SodaStream was founded in 1903 (wow) by W & A Gilby Ltd, London Gin Distillers. SodaStream seeks to revolutionize the beverage industry by providing a better alternative and environmentally friendly way for consumers to prepare their own refreshing carbonated beverages. They are all about consumer, partnerships, environment, and innovation. 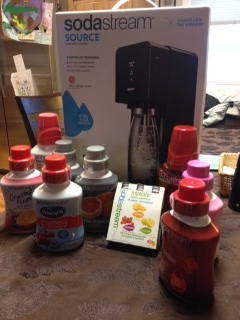 I was thrilled to get the opportunity to review the Source from SodaStream. I love the way this one works. You simply put the bottle under the machine and push it back and it locks in place. No more turning. Then you just press down to get the carbonation of your choice. It will light up to tell you which level you are one (the higher lever the more carbonation you have). So much simpler to use. While I still love my Genesis model I got the first time, and it still have many uses left, it now have been turned over to another loving home so they can now love SodaStream as much as I do. I was also thrilled to get few new flavors to try. Sometimes it’s hard to find all the flavors in the store. My husband really likes he Country Time Pink Lemonade, and my son loves both the Cool-Aid and Crystal Light fruit punch. My favorite by far is still the Diet Grapefruit. You just can’t go wrong with owning one of these machines.